If you’re like a lot of other people, you might be wondering exactly what is the difference when it comes to choosing between a convection oven and an air fryer. If this is you, then you can rest easy knowing that the answer to your question will be provided in this post! Both are efficient and effective methods to help you cook food and if you understand how each one works and the differences between the two, you’ll have no problem picking whichever one might work best for you. 1 How Does A Convection Oven Work? 2 How Does An Air Fryer Work? How Does A Convection Oven Work? What is a convection oven? In simplest terms, you’ll find that a convection oven is essentially going to work as a broiler because it uses fans that help to circulate air all around the food. 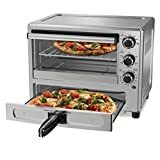 This is different than a conventional oven because those types of ovens just use hot air without the use of any fans to help push and circulate the air around the food. As a result, a convection oven cooks faster and more evenly than a conventional oven. An air fryer is shockingly similar to a convection oven in that fact that they use rapid air technology to help circulate the air all around the food. With an air fryer, you can put a lot of your food in a basket just like a deep fryer where a convection oven requires you to keep the food spread out. You can fry, bake, grill, steam, or roast all of your favorite dishes in an air fryer. Check out a good article on air fryer reviews. When it comes to both a convection oven and an air fryer, you’re going to find that your cooking options are relatively the same with both of these units. Both can be used to cook anything from frozen food, to steaks to fresh cut fries, but these both really excel in producing really crunchy food like you will see below. 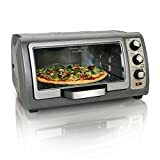 However, a convection oven comes in a larger size than an air fryer so you can reheat your pizza. 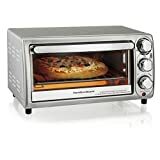 Some large convection ovens such as KitchenAid KCO273SS Convection Bake Digital Oven are large enough for you to cook a rotisserie chicken. Other convection ovens such as Cuisinart Steam & Convection Oven come with a steaming function in addition to basic convection cooking modes. 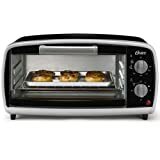 Check out our best convection oven reviews to see what a good convection oven can do. As I mentioned, both of these units do an excellent job of getting food crispy. In general, it’s important to know that the air fryer might have a tendency to dry things out where a convection oven will keep things juicy. When it comes to chips and fries, the air fryer wins hands down. However, in terms of toasting and browning, the convection oven is the winner. For some people, looks are going to be one of the more important considerations so it is worth mentioning. Both are going to look like a standard appliance in your kitchen so there isn’t much to talk about there, but there is when it comes to space. 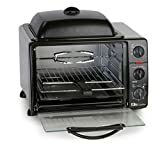 Overall, you’re going to find that the convection oven takes up considerable less space than the air fryer and is much easier for you to leave out on the counter. This is a tricky one to keep in mind but if you are only doing a single layer of food, you will find that the convection oven gives you around twice as much room as the air fryer does. However, if you are cooking in the airfryer, there is a basket which allows you to stack food. Because of this, you can add a little bit more to the air fryer but the convection oven is the best when it comes to a single layer of food. In this instance, you’re going to find that the airfryer is the big winner here and it really isn’t even close. Much like a regular oven, a convection oven takes a lot of time to cook certain foods. As an example for you to go by, you can cook chicken in the air fryer in about 25 minutes but it is going to take about 50 minutes to cook the same chicken in the convection oven. While not all foods will take twice as long when it comes to cooking in the convection oven, it is certainly quicker to cook in the air fryer. It somewhat depends on what you are reheating but in just about all situations, you are going to find that the air fryer does a considerable better job when it comes to reheating food. If you plan on reheating something that you need to stay juicy, then a convection oven might do a better job. But if you are looking for something to get crispy, the airfryer is a great choice. Overall, you’re going to find that it is considerably easier to clean an air fryer than it might be for you to clean a convection oven. The basket can easily be removed from the air fryer to help clean the cleaner when you are done. Unfortunately, most convection ovens do not come with something to catch the drippings on the bottom so it goes right down into the heating elements on the bottom of the oven. While it might seem like a convection oven and an air fryer are pretty similar in terms of features and results, they are certainly different enough to the point where it is important to talk about the difference. With this information at your disposal, you should have no problem picking the appliance that will work best for your needs.